Fresh from last week’s BlackBerry Z10 teaser, DiGi has revealed that the telco might be announcing its Sony Xperia Z’s offerings tomorrow – ahead of the device’s public release later this week. 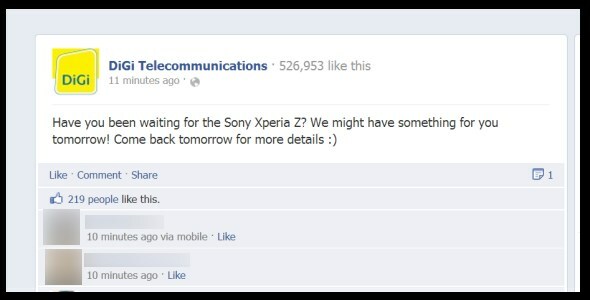 This revelation pretty much echoed what Ola Lilja Molen, the Head of SEA Markets for Sony Mobile has mentioned at the device’s launch event last week that the company has already been in discussion with local telco for Xperia Z’s upcoming market release although he declined to mention the actual telco. So, what it could be then? Contractual plans? Discounts? Free gifts? Well, we believe that it will be contractual plans but we are definitely open to suggestions until the actual announcement to be made tomorrow.